VANCOUVER, BC--(Marketwired - May 01, 2017) - The Women Lawyers Forum (WLF) of the Canadian Bar Association, BC Branch (CBABC) celebrated two outstanding women at the 2017 WLF Awards Gala Dinner on April 27 at the Fairmont Waterfront Hotel. Attended by over 450 people, it was the largest event in WLF history. Linda K. Robertson received this award celebrating the accomplishments of a woman who has broken new ground for women in BC's legal profession. Linda is recognized as an exceptional woman for risk-taking, change-making and opening doors for other female lawyers. The WLF Award of Excellence acknowledges her distinguished career contributions. Rachel Mockler received this award honouring the memory and accomplishments of Debra Van Ginkel, QC who sincerely believed women lawyers need a mentor for support and encouragement in their professional and personal lives. In 2003, Van Ginkel's vision for a mentoring program to sustain and enrich women in the legal profession was realized with the establishment of the CBABC WLF Mentoring Program. In Debra's memory, Rachel Mockler is recognized for her dedicated mentorship of BC women. "Once again all the nominees for both awards were outstanding. There are so many women in the legal profession doing incredibly well and the WLF is very proud to acknowledge this year's winners," said Kathryn Sainty, WLF chair. "We continue to be inspired through their invaluable mentorship and professional contributions." 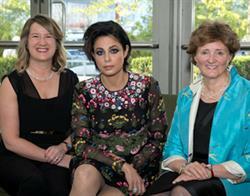 The gala's guest speaker was Toronto-based criminal lawyer, Marie Henein. Widely considered one of Canada's best in her field, Henein has been described as fearless and brilliant and has acted as counsel on some of Canada's most well-known cases. CBABC WLF acknowledges its 2017 sponsors including Fasken Martineau, Koffman Kalef LLP, Branch MacMaster LLP, HHBG Lawyers, Hamilton Fabbro, Jenkins Marzban Logan LLP, McCarthy Tetrault, Onyx Law Group and Watson Goepel.